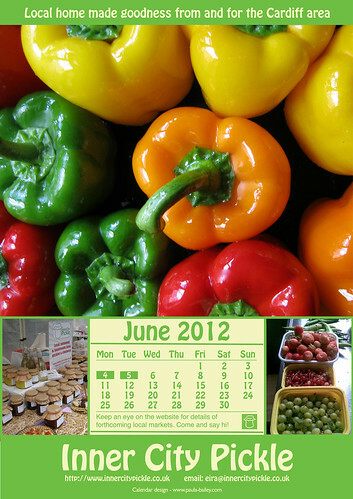 It’s already time for the June page of Inner City Pickle’s 2012 calendar which is free for you to download and print. It really will brighten up your kitchen, as would a few jars of Eira’s delicious wares. This month she’s been working hard on some new Aubergine Chutney, and Dukkah (which she tells me is “ground roasted nuts, seeds and spices – nice when dipped in with bread and olive oil”). What I’m really keen to taste though is the new season Strawberry Sauce – it always looks so amazing. Sadly for me, Inner City Pickle is low carbon footprint, local produce for local people – if you’re in Cardiff! If you are in the Welsh capital, however, you can find Eira and her Inner City Pickle stall at Roath Market three times in June – 2nd, 16th and 30th. No excuses – pop along and have a chat. To download June’s calendar page, just click on the image below and you’ll be taken to a full sized version which you can download and print. It works at A4 and A5 so take your pick! The July page will be available at the end of the month. If you don’t want to miss it, why not sign up to see new posts as soon as they appear.